A big part of my wardrobe is work out clothes. A lot of my work out tops are pretty fitted, which is great normally but is not so encouraging when you have a postpartum tummy! I just had a baby 3 weeks ago, and all my workout bottoms still fit (thank you stretchy waistbands! ), but I was seriously lacking in flattering tops that I can work out and feel good in. 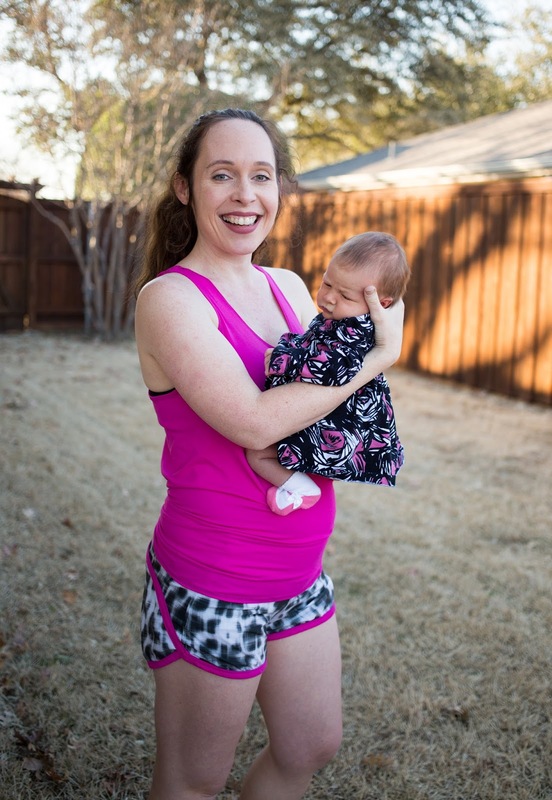 I am a runner at heart and kept up my weekly mileage goals until about 5 years ago when I had Luke. Since then, I still run but am not so serious about it. I keep up my gym workouts and do lots of long walks with the kids. When I am released to start working out again, my plan is to safely amp up my mileage again. 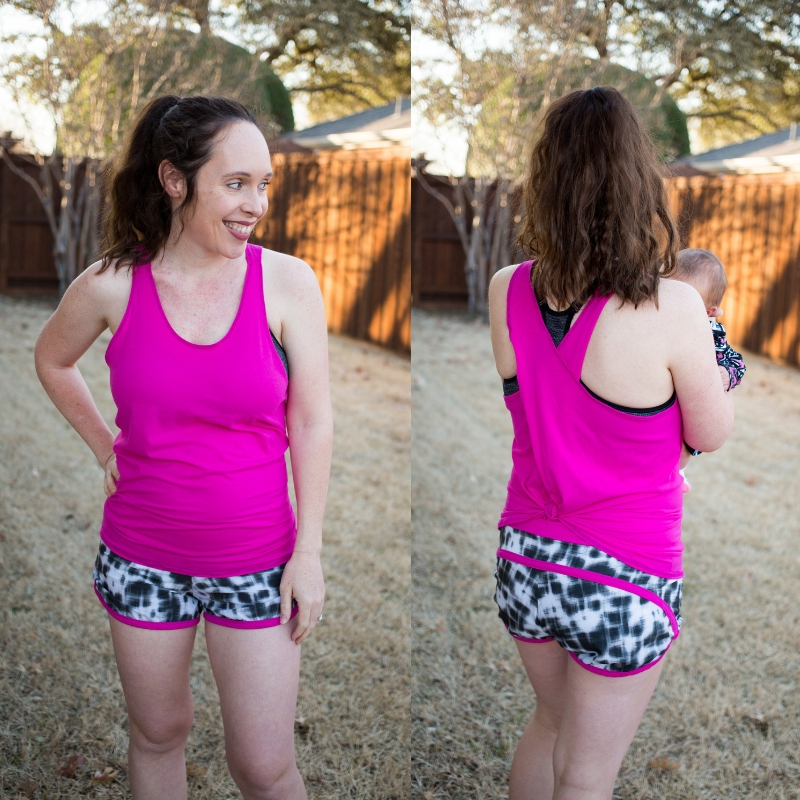 I was super excited to get to test Greenstyle's newest workout top pattern - the Xpress. It is so aptly named too because this is one of the quickest garments I have ever made! It is one pattern piece. The only seams are on the shoulder. There are no bindings. One quick hem, and you are done. OH, and I made all my tops just with my sewing machine; so, don't be discouraged if you don't have a serger or coverstitch. Since they were so quick, they were also so satisfying! I have not had ample amounts of time to sew like I normally do, but these quick tops made me feel like I was back at it! There are 3 views to the Xpress pattern - a curved back, a straight pointed back, or a tie back. There are also two necklines - a high or low neck. I made all three of my tops with the low neck option. I made two of the three views - a curved back and tie back. First up is a tie back top in Simply by Ti's Nike Wickaway jersey in navy. This fabric is textured on the right side and smooth on the inside. The smooth inside will be great for preventing any chafing on a long run. This fabric has wonderful drape for a looser workout top and has a very nice 4 way stretch with great recovery. I also got to test out the moisture wicking properties of the fabric on my way out for the photoshoot. I picked up the happy baby, and she spit up all on me! In my hair, down my shirt, and all the way to my shoe! I cleaned myself off, and my shirt was dry in seconds! Thanks for stocking this amazing fabric Ti! Pink may just be my favorite color, so I love this next tank. 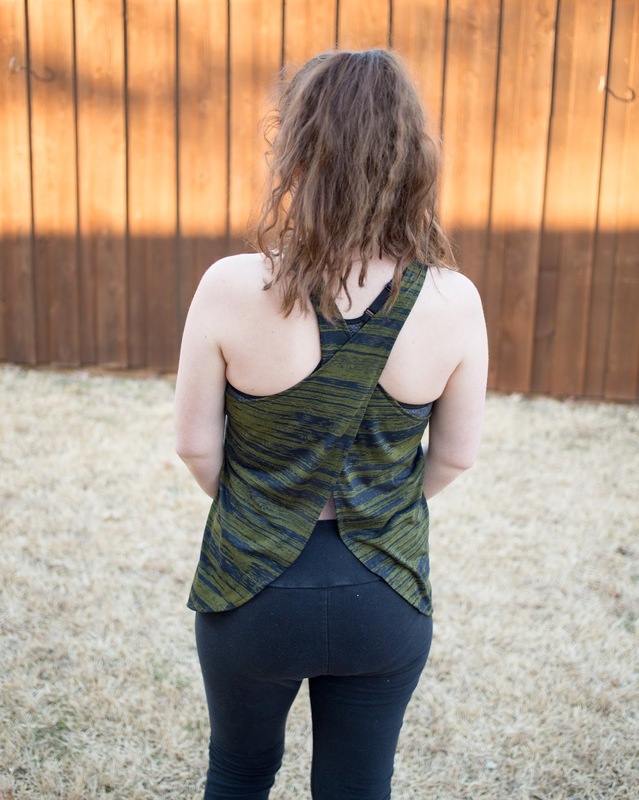 It is a curved hem Xpress tank top in a brushed nylon I got from Aimee Wilson's scraps. She has the most amazing scrap bin ever. I messed up with hemming the back of this top, though, so I tied the back, and it still looks very good. It is just more fitted around my tummy when tied than the regular tie back view of this pattern. I messed up because this fabric is super stretchy, and I accidentally stretched it while hemming, which made the hem wavy along the curve. No amount of steam would fix it either, and I did not have time to seam rip. Happy mistake because I love how it turned out. The shorts I am wearing with the navy and pink tops are my Moxi shorts (blogged about here). 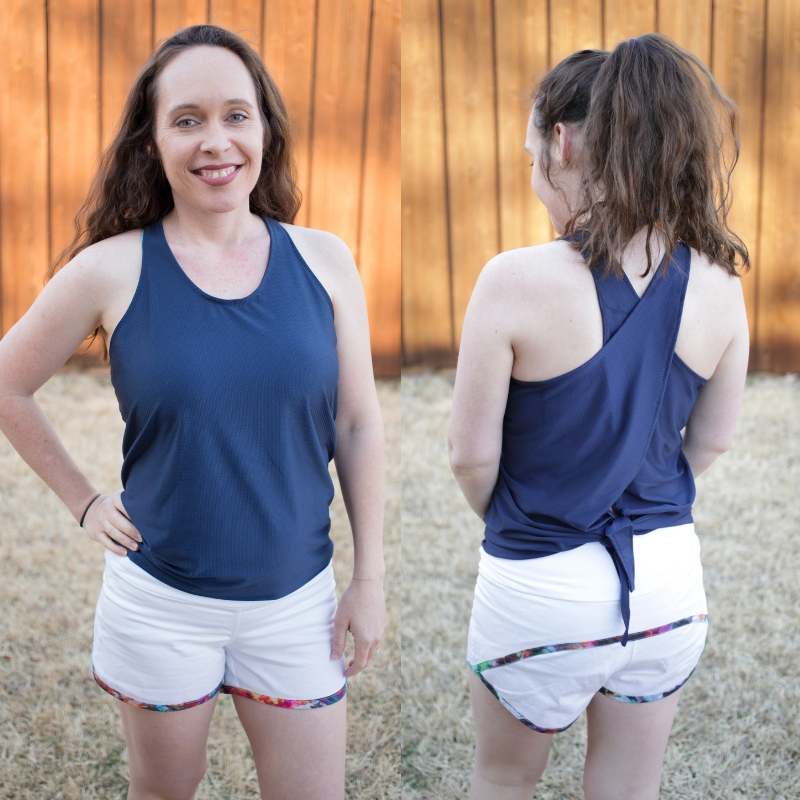 This top pairs so nice with the Moxi shorts. It shows off the back trim of the shorts so nicely. 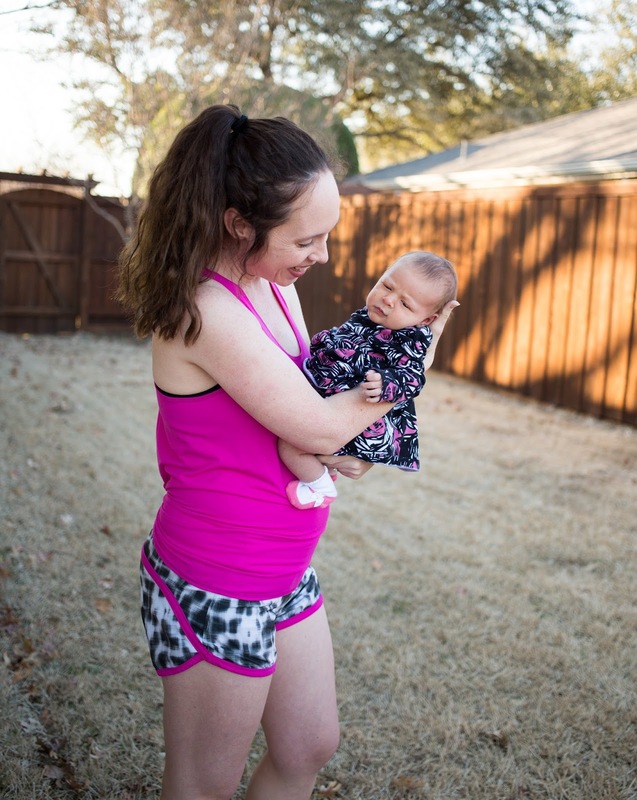 And, I got some super cute photos with baby in my tops. Hannah is wearing a Shirtzie dress. Lastly, I made an Xpress top in a jersey blend fabric. This fabric has only 50% horizontal stretch, no vertical stretch, and is a more stable fabric. 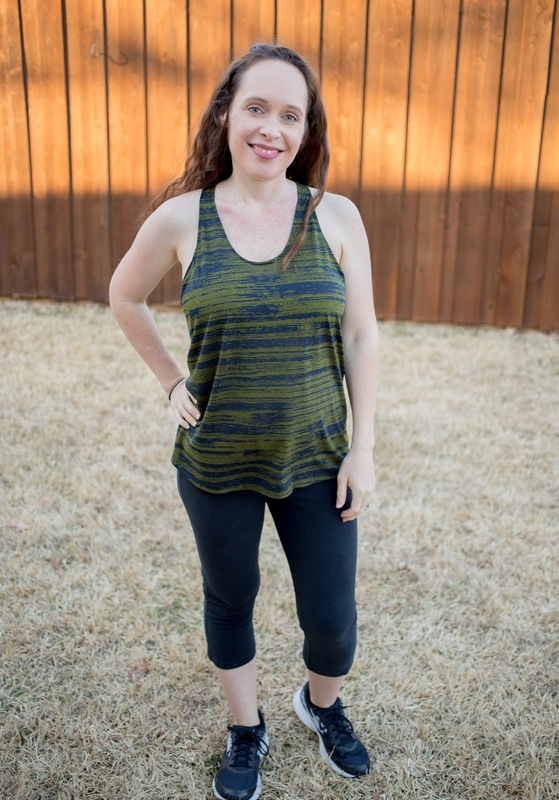 This fabric was a great choice for this top and will be great for working out or just as a summer top for the Texas heat. You can grab your Xpress pattern here. I think my next few Xpress tops will be made in a dressy fabric for a date night. My husband seemed to love the low neckline and breezy back view! What fabric will you make yours out of? What is your favorite way to stay active? Hey, this is super amazing share about Greenstyle Xpress Tank Top. Thanks for this nice write up. I usually wear these tops for my work outs. In fact I already have the Carbon38 tank tops and leggings for my work outs. Their fabric is amazing and just so smooth for my sensitive skin.